may you, your family and klal yisroel find only true menucha and as you said iy"H soon we should be dancing on the streets with Levi with the coming of Moshiach! May you only know of good things! 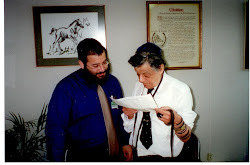 You are such a special chossid, and brother to Miriam and Levi Z"L.
He would have loved reading what you wrote about him.